On Sept. 27, BlogCatalog became the first social network to ask its members to collectively call for an End To Abuse. On thousands of blogs all over the world on the same day, BlogCatalog members and other bloggers did. Google revealed more than 66,000 mentions of “Bloggers Unite” and abuse; more than 10,000 of those included “BlogCatalog,” linking back to the campaign so other bloggers could be discovered. Collectively, it represents a powerful call for awareness and action that is hard to ignore: links, comments, etc. But are these the measures? In terms of increasing awareness across the Internet perhaps. But more important than any numbers are the individual posts themselves. Each, on their own, had the power to touch people’s lives. These represent the real outcomes. To highlight a few, Copywrite, Ink., in cooperation with BlogCatalog, invited any blogger who participated in this campaign to submit a link and other measurements for consideration in our Blog For Hope Post Competition. Wines wrote about an everyday hero. 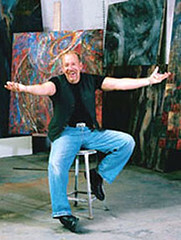 Robert Miley (pictured), an artist in Phoenix, has developed a workshop curriculum for abused children and at-risk youth to discover themselves and gain empathy for others through art. Art is often used as a medium for children who have suffered abuse to transform their pain and association with the abuse into something manageable. Wines’ efforts to recognize Miley through Bloggers Unite brings awareness to a technique that helps victims cope with abuse. Sweat chronicled how verbal abuse sometimes escalates from put-downs under the guise of jokes into disparaging comments that aim to control, manipulate, and intimidate, leaving an impact on the victim forever. She then gave readers information from several sources and prompted the victims of verbal abuse to contact the state branch of the National Coalition Against Domestic Violence if the abuse crosses into domestic violence. Corbett revealed a very personal story of how, by learning more about the foster care system, she was personally touched and moved to action. Her family has adopted ten children from the foster care program and is now working to build a group of homes for siblings, children and youth on 80 acres of land so they may receive the caring, understanding, and unconditional love they deserve. Hartley B. Singer, PetLvn summarized dozens of powerful posts to call for an end to animal abuse. He includes information about what you can do to help. The NAFASG Team, NAFASG captivated readers with a powerful tribute to a Nurin Jazlin, who was abducted and murdered. The story is shocking; the call to action memorable, with scores of people joining their efforts to end child abuse. CreativeBlogger used ProBlogs to share the undeniably tragic story from Africa — adults infected with HIV sexually assaulting children, which is a death sentence beyond the abuse these children already endure. Cynthia Newcomer Daniel, Jewelry Tales, gave up space to recount her personal story of abuse, demonstrating true courage in sharing her story so that others might know they are not alone. Saphyre Rose, Sun And Moon Sorcery, who is a 25-year cancer survivor, stopped us with a powerful introduction: I was a victim of abuse. She shares her personal experience and prompts victims to have the courage to take action. In the weeks ahead, I will be contacting the first three bloggers, mentioned above, to make arrangements so they may receive additional recognition. For details, please visit the competiton post. We will also be profiling one of the first three bloggers, every Sunday, starting next week. Thank you for touching us. Thank you for making a difference. And thank you for giving us hope. How exciting! This was a wonderful opportunity to do good and I am so proud to have been a part of this. You, of course, are so inspirational and so kind to recognize everyone. My congratulations to everyone who took part and to all the winners. Many, many thanks to BlogCatalog for their efforts. They are simply the best at what they do. I appreciate them and you more than you know. Lastly, I thank you for the 2nd place award. I would be remiss if I did not thank and recognize the other half of Margie & Edna. Edna is superbly written by my friend, LisiBee, also known as Beth. Without her Margie would not be possible. Again, thank you Rich and BlogCatalog!! I am glad you submitted. Like all of the posts, the judges only had kind things to say. Congrats to Beth (LisiBee) too. When I profile your blog and post I will make sure she receives recognition as well. Thank you very much for the Honorable Mention; this was a subject I feel very strongly about, and, as difficult as it was to write about, I am very glad I did. Thank you for the opportunity to tell my story and participate in such a wonderful event. Truly, the thanks belongs to you. I admire your courage, am sorry you had to experience such pain, and think you are an amazing person who has helped many as a result of sharing your story. It is a gift to share such things. Once touched by a gift like that, no one is ever the same. Thank you. Thanks Rich for the honorable mention! Participating on 9.27.2007 in Blog Catalog's "Bloggers Unite" challenge and blogging all day to bring awareness and to stop animal abuse and pet cruelty was .. well, let's just that was one of my good days I think. I hope the google juice keeps bringing new readers to all of our posts and calls to bring an end to all types of abuses around the world. PS // it's PetLvr (not PetLvn) short for Pet Lover .. although Pet Lovin' is always good too. You know, I loved your post because it so eloquently presented its own ideas while weaving in so many other great posts. Really, it was the must read of animal abuse post out there and I'm glad it was noticed. You're an amazing blogger. Well done everyone who participated in this worthwhile cause, everyone is a winner, but especially well done to the top 3. I am proud and delighted to receive an honourable mention for my article published on problogs re the Aids myth. Rich - Thank you so much for this award. I'm amazed, and humbled. But Robert Miley, and the innovative and kind work he does with abused and at-risk youth, is the focus. It's so easy for me to become overwhelmed with the issues currently facing human beings in our world. It can make me angry and paralyzed. But then I look at Robert, who heals and evolves wounded children, and I am hopeful again. Thanks for giving me the opportunity to meet other bloggers and read their wonderful work. Congratulations to all who participated and those who are featured here today. Rich, you are truly amazing! You "Wow!" me again and again. Creative Blogger, it was a great post. Very eye opening. Education on that continent is key. For a few billion, we could educate the world. Lisa, I look forward to touching base with you in the week ahead for a follow up interview (as well as take care of other details). We hope it draws additional attention to Miley's work too. Oh Congrats to Lisa from OMyWord.